Formerly of the militant order of the Sisters of Battle, Eurydice was ceremoniously dismissed from her order for the sin of falling in love. A pariah from her people and questioning her faith, she fled to the Koronus Expanse where she quickly fell into the company of low people and sinful ways. Then fate (or the Emperor) intervened. The ramshackle space-station where she was living was invaded by a mob of Goffs, who strafed the station and then attempted to board. With the atmosphere venting into space and chaos all around her, Eurydice managed to rally the station’s inhabitants and crew to fight off the incursion. She single-handedly killed the Ork’s Warboss and took his chainsword (and his head) as a trophy while the rest of the Goff mob fled, never to return. Though Eurydice was not aware of it at the time, the Orks had been sent there by a rival of the D’Stayne family to kill young Morgan. The scion of the Rogue Trader family saw this woman’s ferocity and remembered it. Sometime after the battle, the Tyrant Sun arrived in the system looking for her. Morgan, now captain of the ship, offered her a position (and more than that, a goal to live for) and she gratefully accepted. Eurydice was training to join the Order of the Hospital, to be not just a warrior but a battlefield doctor and surgeon as well. While still in training, she was assigned to care for a young Space Marine warrior who had been injured in battle. Over the next few weeks, the two of them grew close and, as these things sometimes happen, fell in love. It would’ve gone unnoticed and unremarked, but that Eurydice found herself pregnant. The dishonor was too much for the Order. The Marine was sent back to his Chapter, presumably to be disciplined there. Eurydice was placed into solitary confinement where she did penance for nine months. When the child was born, he was taken to be raised by the Ecclesiarchy. Eurydice was dismissed from the order. Where her lover went, and where her child is now, she does not know. She now seeks penance for her sins. Exploring the edges of known space, converting the heathens, braving dangers unknown, and slaying xenos, demons, and traitors seems like a good life to her now. A tall woman with short blonde hair and icy blue eyes, made even icier by her cold glare. 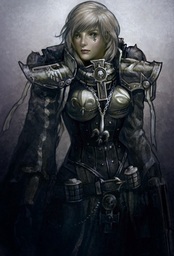 When on duty, she wears a suit of black power armor (though not official Sisters of Battle armor, as that was stripped from her when she was discharged from the Sisterhood). Those who don’t know her well would call her cold, haughty, and arrogant. Those who know her better than that see she is a soul in pain. She spends much of her off-duty time in the chapel, praying for absolution. Eurydice seeks absolution for her sin, perhaps by slaughtering any who would deny the God-Emperor’s right to rule the galaxy, perhaps by dying in battle. Having only recently joined the crew, she keeps herself apart from the others (what they might view as “too proud to mingle” she sees as “too ashamed to show her face”). She’s not an unthinking brute and doesn’t charge recklessly into battle, but she does not hesitate to throw herself into danger if the situation calls for it.